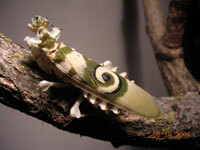 Pseudocreobotra is a small and colourful genus with a typical eye-spot-similar spiral on the wings. The visual nature is analogue to Creobroter. 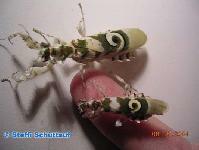 But Pseudocreobotra has many appendages and "excrescence" which gives them their typical bizarre look. Both sexes have conical, on the top rounded eyes. They protrude over the head. At night they embrown. 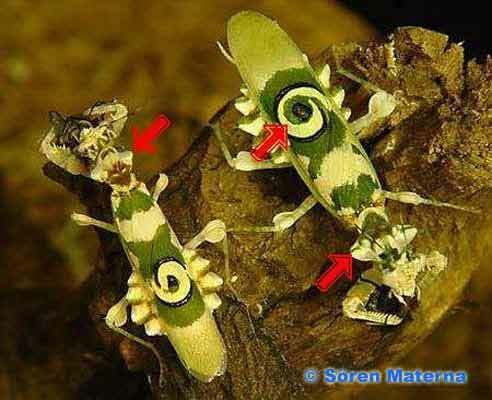 The males of this genus are more susceptible to interference than the females. But also the females are easily to stress, e.g. 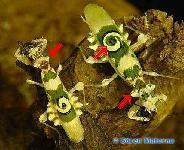 when spraying the terrarium they threat or run away hectically. This genus suits to only a limited extent for community- keeping. The females should be single- kept, while males can be kept in small groups. The nymphs, alike Creobroter- nymphs, can take on the colour of their environment, as far as possible. So a rose-, blue-, green-, white- etc. colouring is possible. The sexing is easy to take frome L5/ L6. 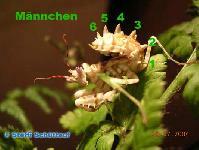 The females have just 5 abdominal- appendages on the underside, however males have 6. P. ocellata and P. wahlbergii are easy to differ by their adult- size. The clockwise and the anticlockwise spiral on the wing can not be used to differ between the species! The twisting is a result from both wings, which have contrary spirals, so the rotating direction depends on which wing is up. At present, P. amarae (REHN, 1901), P. ocellata (PALISTOT DE BEAUVOIS, 1805) and P. wahlbergii (STÅL, 1871) are described. Pseudocreobotra is a more ambitious genus in keeping, because it needs high temperature and a high moisture. P. wahlbergii and P. ocellata are often kept. With some practice they are easy to differ. The colour of the eye-spot on the wings are diverse, so P. ocellata has a citreous one, while P. wahlbergii`s is more orange- yellow. But also pale coulours are possible, therefor this attribute is not valid anymore. Furthermore P. wahlbergii is ca. 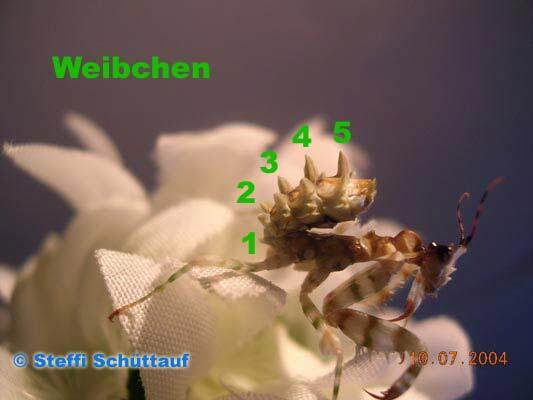 5mm- 10mm taller than P. ocellata. It is a myth, that you can differ the species by the rotation direction of their eye- spot, more information above.